The temperatures are getting cooler and cooler, and sweater weather is finally here! 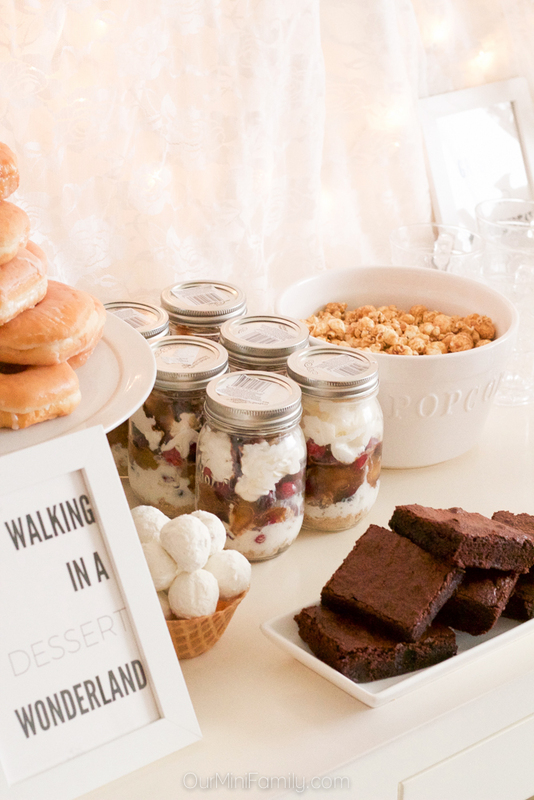 What better way to celebrate the arrival of the most magical season all year than by hosting a dessert bar party! 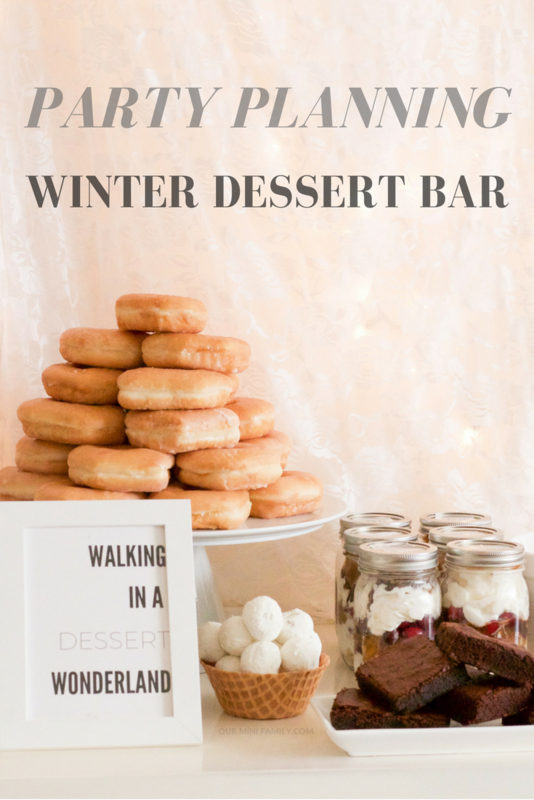 This winter dessert bar features a full tablescape complete with step-by-step instructions, tutorials, and detailed photos to help you prepare for your winter party. 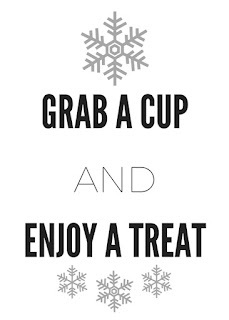 When I think of winter parties I imagine tables filled with decadent sweets, hot chocolate, and rich desserts. 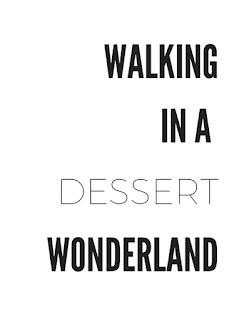 Today, I'm sharing a few recipes and tutorials inspired by some of my must-have winter dessert products. 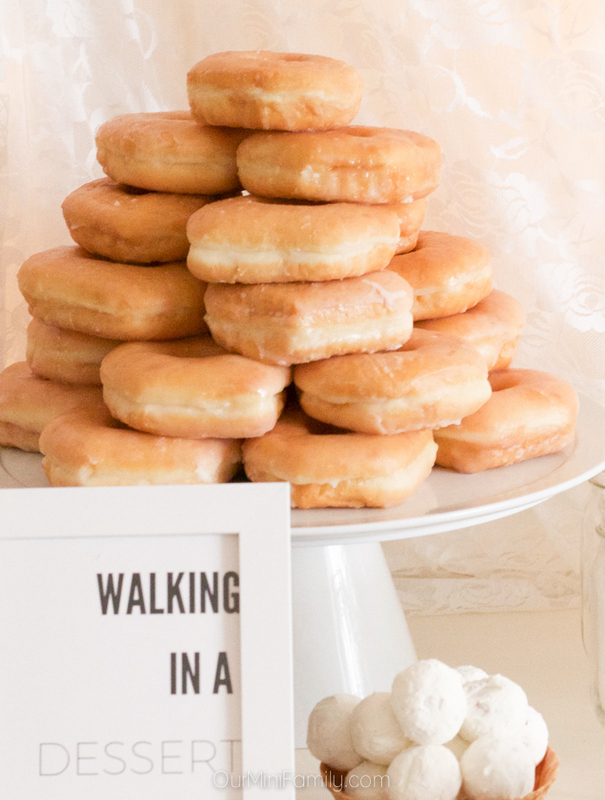 This donut tree is always a topic of conversation at parties! 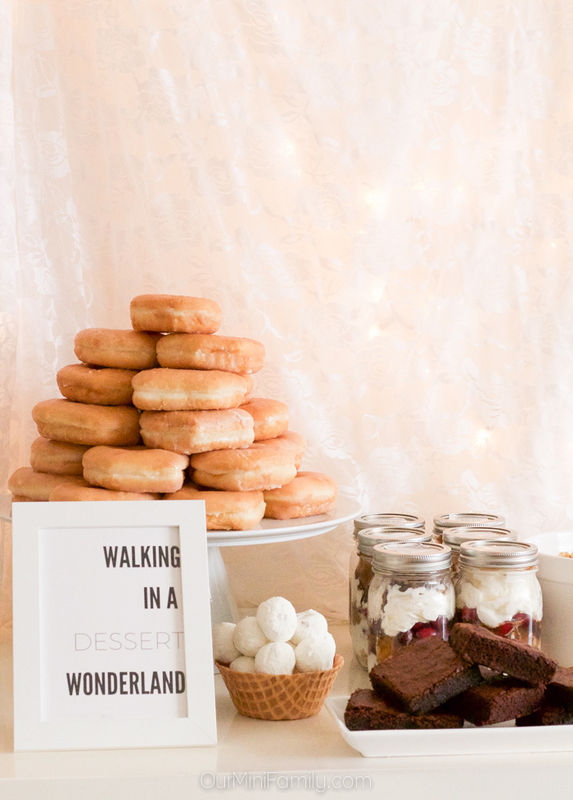 Whether you're serving a morning brunch or a dessert bar at your home, this donut tree will surprise and delight your friends, family, and co-workers. Nothing brings people together better than pretty, soft glazed donuts stacked up nice and tall. To create this DIY donut tree, you will need approximately 2 dozen donuts (we used a large cake plate as our base, so you may want to opt for fewer donuts if you are making a smaller tree). Start by layering the donuts in a wide circle along the rim of the base. Continue layering donuts on top of each other in a circular shape, and begin layering them closer and closer towards the middle so that the "tree" (or donut statue) becomes more narrow. 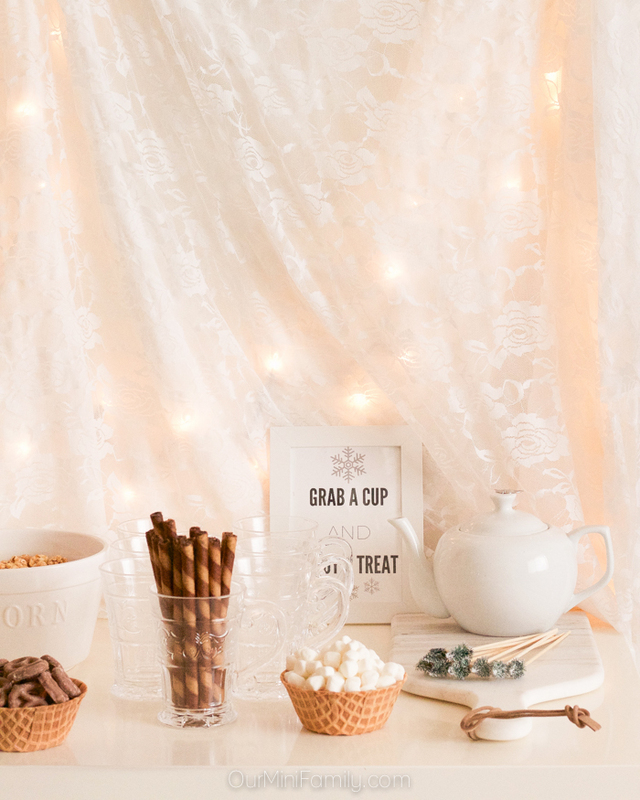 To create this simple and elegant, winter wonderland-inspired party backdrop you will need: 1-2 strings of white lights, sheer white fabric, and something to adhere the white lights/fabric to the wall. 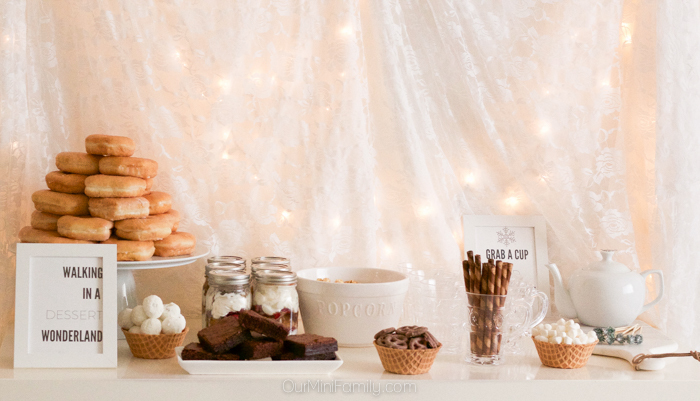 Plan your party table in an open area near a wall socket. Preferably, pick a wall that already has frames/decorations hung up on it. 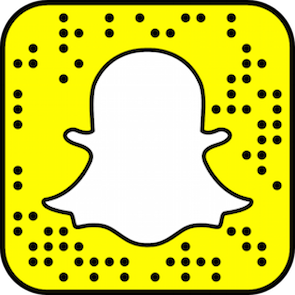 Clear the wall of any decorations/frames. 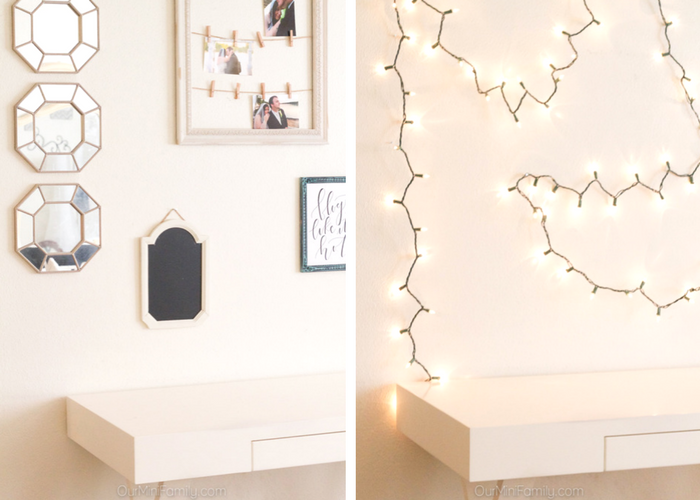 Hang string lights on the wall on top of pre-existing nails in the wall (or you can opt to use temporary adhesives such as heavy-duty tapes, etc). 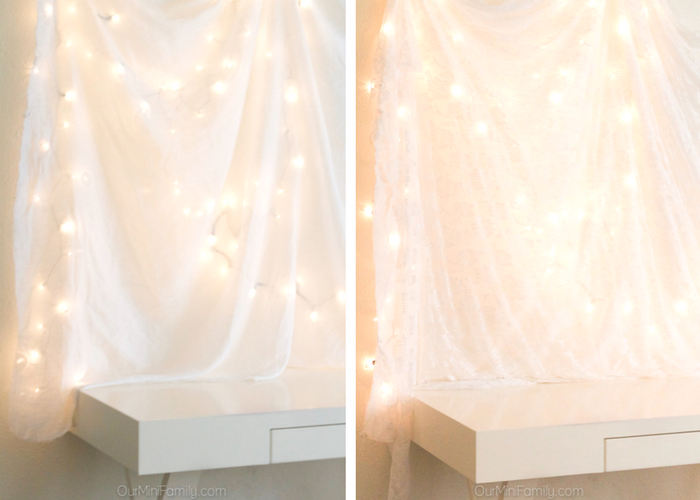 Lay a sheer, white fabric over the top but careful to not touch the lights. Lay a secondary fabric over the top of the first fabric (optional) for a luminous effect. PRO TIP: set up your party in a space that already has nails in the wall! 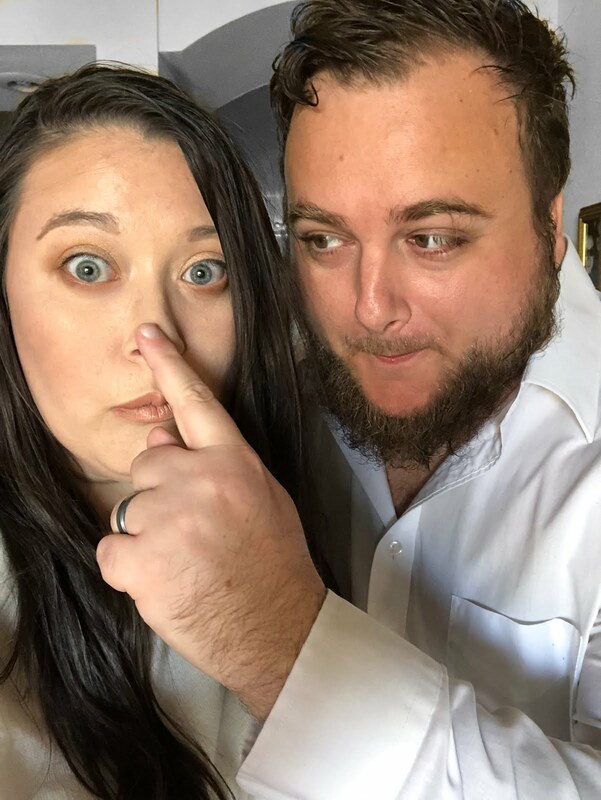 I like to take down my picture frames on my wall and store them until after the party is over, and I use the nails that are already set into the wall to hang everything for my party backdrop! 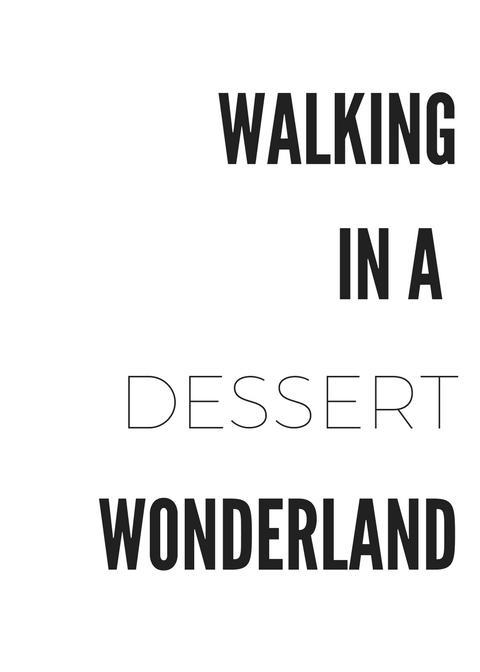 For our winter dessert bar, I wanted to create printables that are clean and minimalist enough that anyone can re-use them (and also be conservative enough that they don't take away from the beauty of the desserts on the table). 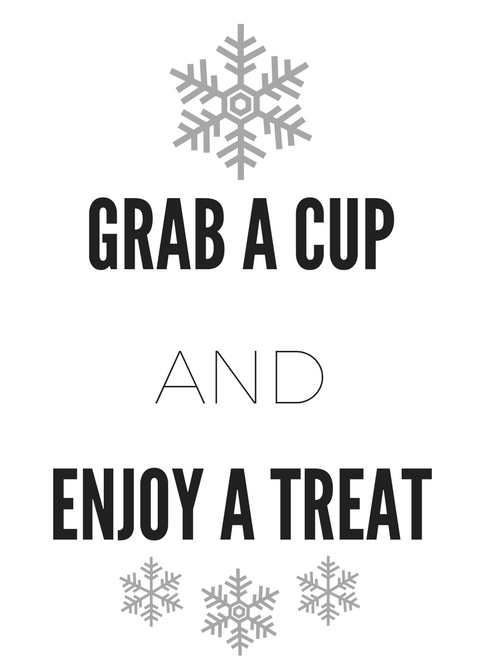 Click the "grab a cup and enjoy a treat" download and "walking in a dessert wonderland" download links (or save the images below) to grab these free printables for you to enjoy! They are designed for a vertical 5x7 (but you can also download them to scale smaller to 4x6 if you prefer). 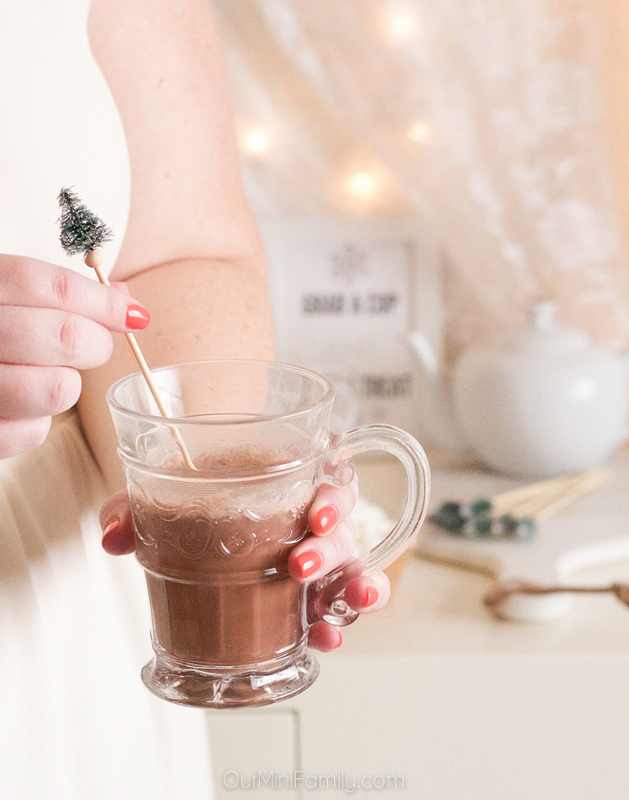 Transfrom everyone's favorite hot chocolate into a dipping sauce! 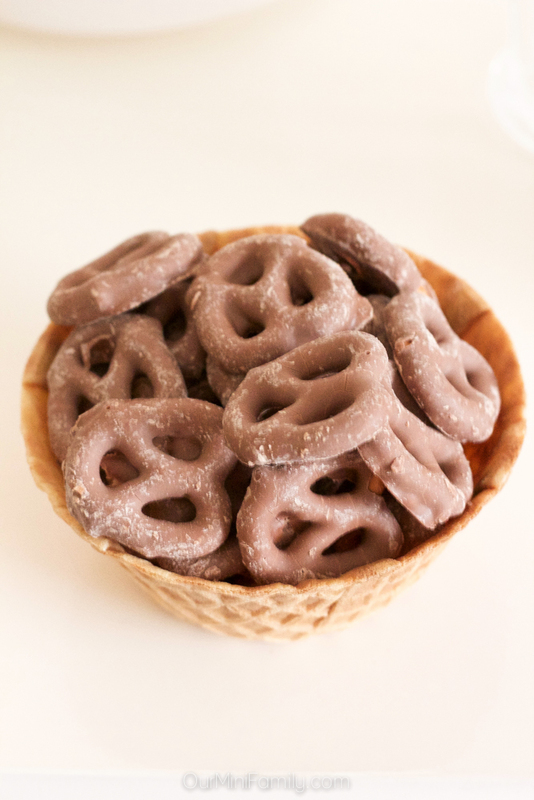 I've been making my own hot chocolate pretzels for years because it is so easy and tastes just like the store-bought kind! 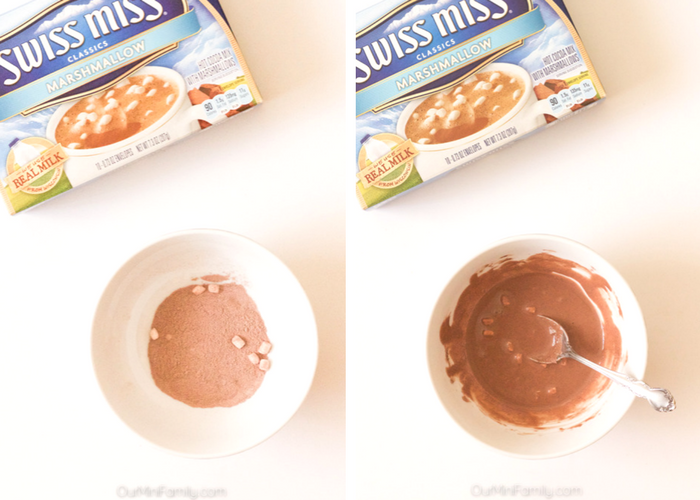 Pour out the contents of one Swiss Miss sleeve into a small bowl. Pour in about 2 tablespoons of half and half (you can add more depending on what kind of consistency chocolate sauce you want), and then stir well. 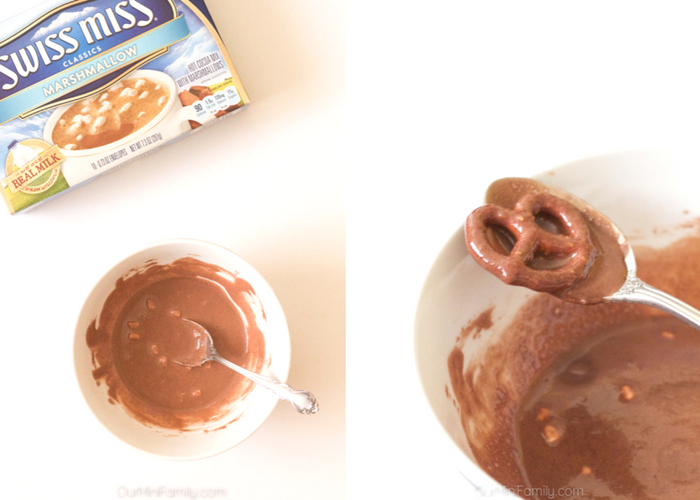 Begin dipping pretzels into the chocolate sauce, and then set them onto a non-stick surface (I use silicone baking sheets) and set them into the refrigerator for a minimum of 4 hours. Serve either chilled or room temperature! 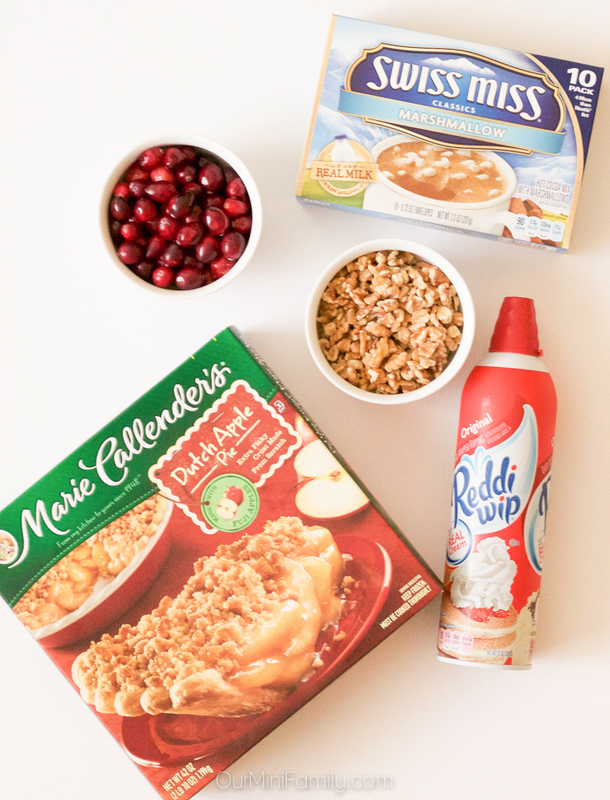 This winter, tiramisu-inspired mason jar treat is rich with delicious Marie Callendar's® Dutch Apple Pie, Reddi-wip® made from real cream, and other decadent winter dessert elements! Bake the Marie Callendar's® Dutch Apple Pie as directed, but do not add on the pie topping in the final steps. Save the pie topping for step 4. 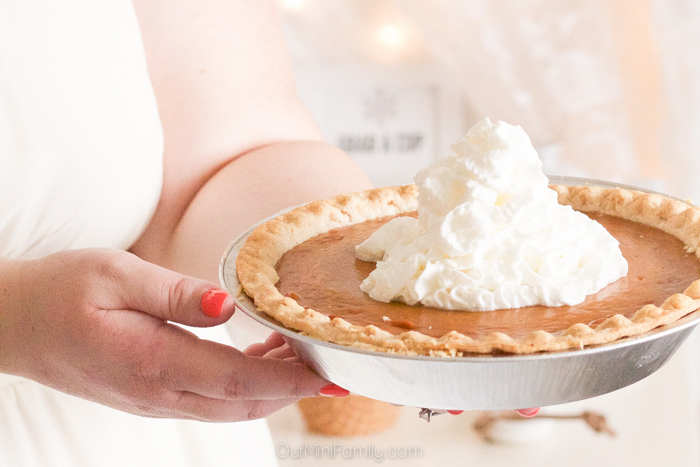 Once the pie is done, you can begin with the next steps. 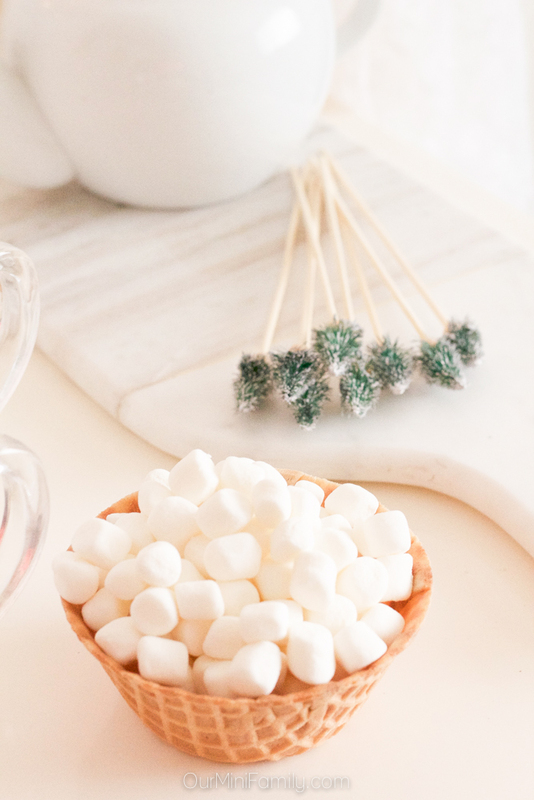 Using a small bowl, combine the Swiss Miss Marshmallow with the half and half and mix well. Mix until the texture resembles a chocolate sauce. 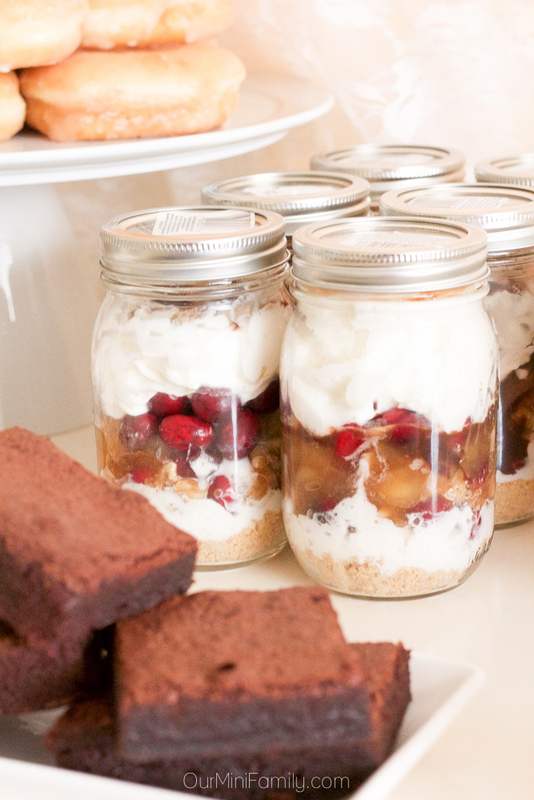 Fill the bottoms of 6 small mason jars with the Marie Callendar's® Dutch Apple Pie pie topping. 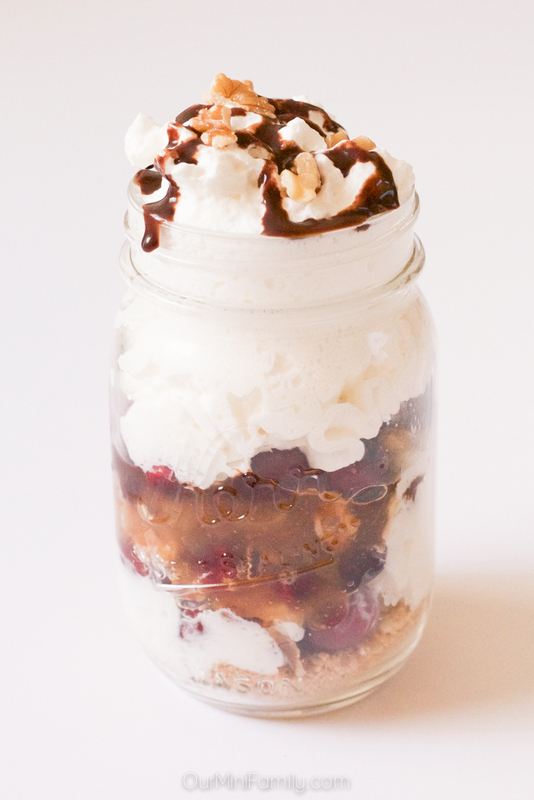 Begin layering the mason jars in the following order: Reddi-wip®, followed by a small handful of cranberries and walnuts, followed by 1 large scoop of cooked Marie Callendar's® Dutch Apple Pie, followed by another handful of cranberries, followed by more Reddi-wip® with a little bit of Swiss Miss Marshmallow sauce, and finally topped off with a small amount of chocoalte sauce and a few walnuts (see images below). 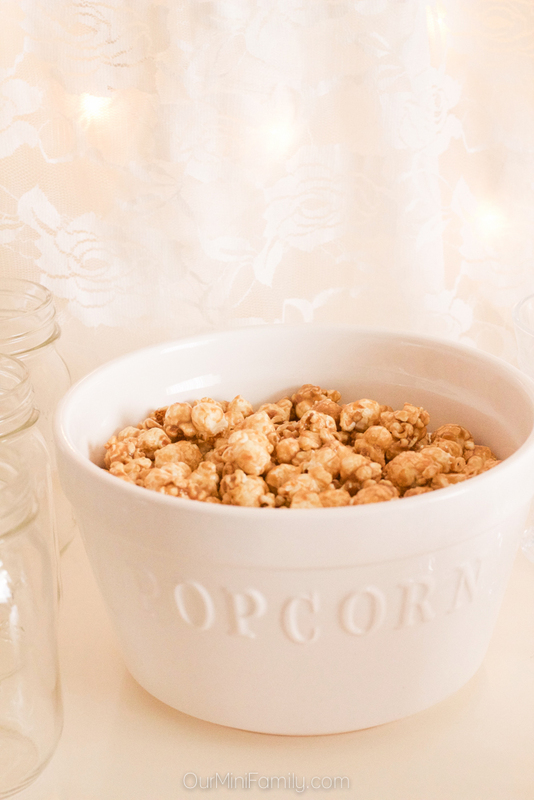 Close the mason jars and serve to enjoy! 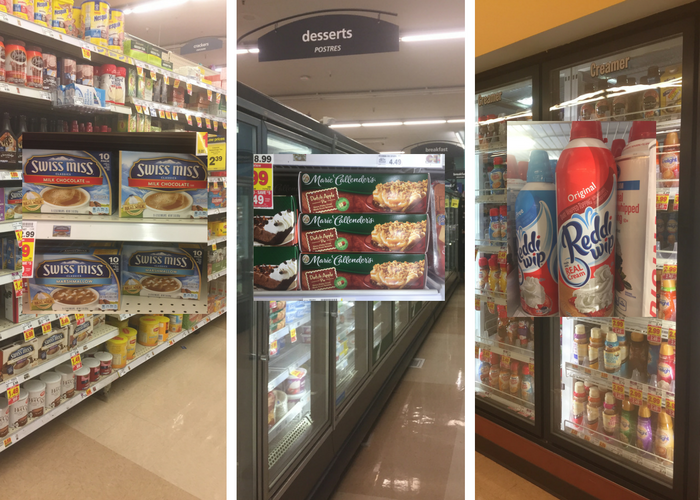 When I went to our local Fry's to shop for our winter dessert bar, I made sure to pick up Marie Callender's Dessert Pies, Swiss Miss, and Reddi-wip® products to make this yummy winter tiramisu-inspired mason jar treat! 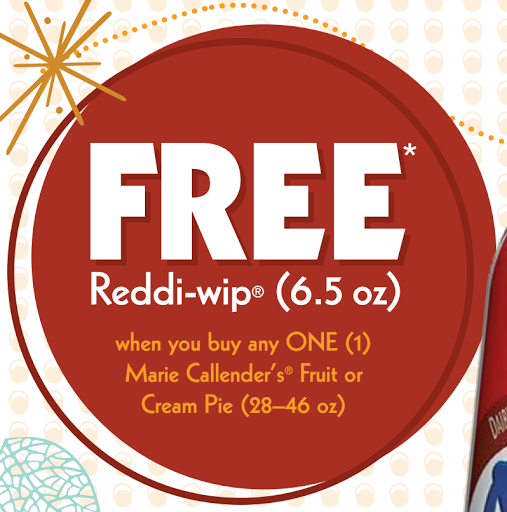 Receive a FREE Reddi-wip® (6.5 oz) when you buy one Marie Callender's Fruit or Cream Pie (11/16-11/24). Generously spray a small baking pan with coconut oil or grab a non-stick baking pan (e.g. silicone based) and set it aside. Remember, the shorter/smaller the pan is, the thicker the brownies will be. 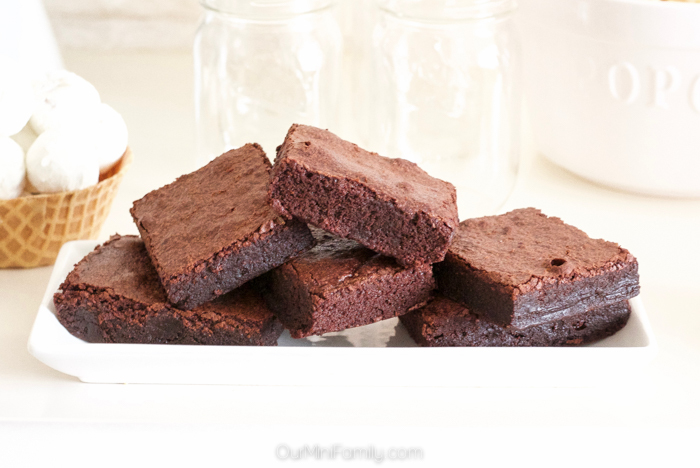 Thicker brownies will bring a richer texture. 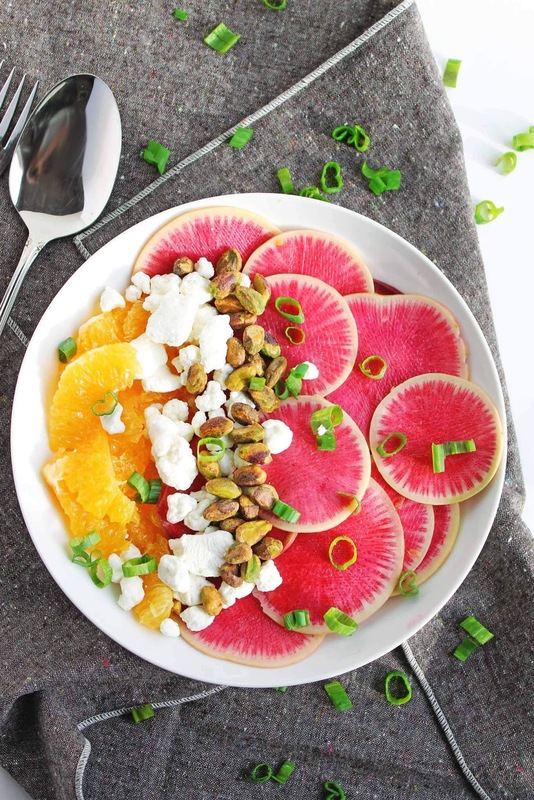 Grab a large mixing bowl and combine the butter, eggs, sugar, and extracts together. Beat the ingredients well--if you're using a mixer/speed mixer, opt for medium speed for 2-3 about minutes. 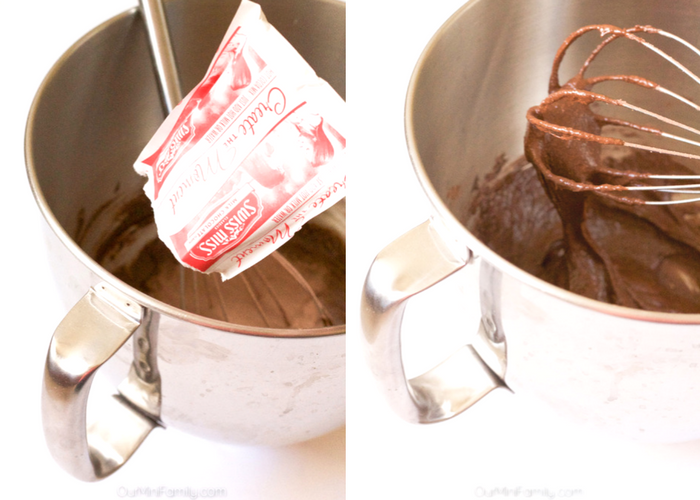 Gradually add in and whisk the baking powder, cocoa powder, flour, and finally the Swiss Miss Milk Chocolate into the mix until it's totally mixed. The final texture of the brownie batter should be ultra gooey (pro tip: if it runs too smooth and drips too quickly from the whisk, add in a little bit more hot chocolate mix until the texture thickens). Pour the brownie batter into the baking pan and allow it to sit for 10-20 minutes untouched. Letting the batter sit before putting it into the oven will help you achieve that desireable, almost crunchy brownie topping. Bake the brownie pan in the oven at 350 degrees (F) for 30-40 minutes (or until you can pierce the center of the brownie with a toothpick and it comes out almost entirely clean). Remove the brownies from the oven and allow it to cool completely before attempting to remove the brownies from the pan. I reccomend letting the brownies cool to room temperature first, and then storing them in the refrigerator for 3-4 hours before attempting to serve. 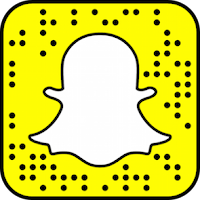 This will ultimately help you get the deseriable texture, shape, and give you the best scenario for cutting out "perfect" looking brownies. 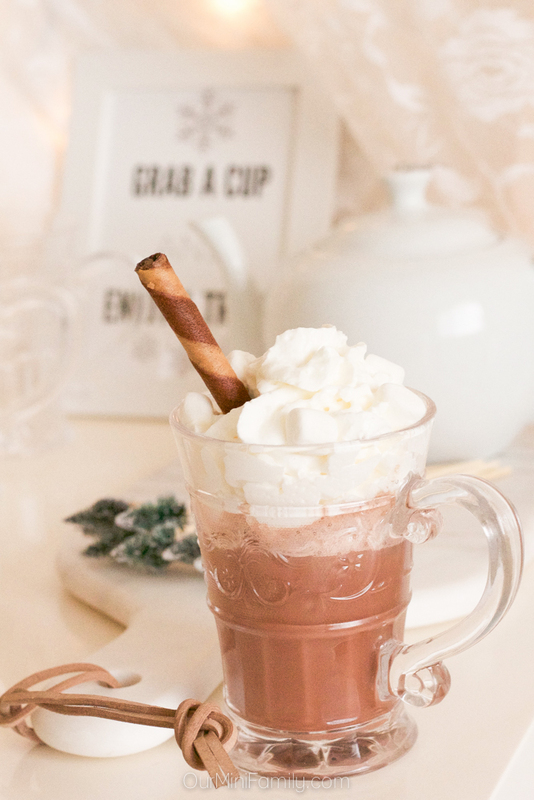 Enjoy your brownies with a cup of Swiss Miss Hot Chocolate for some extra joy! Don't forget to save this party tutorial to Pinterest! 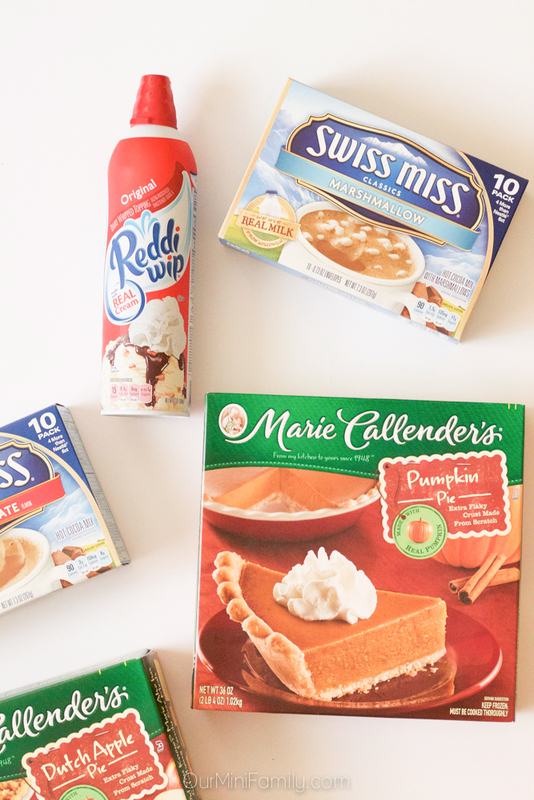 Print this coupon to save $.55 NOW on a Marie Calendar's Pie!